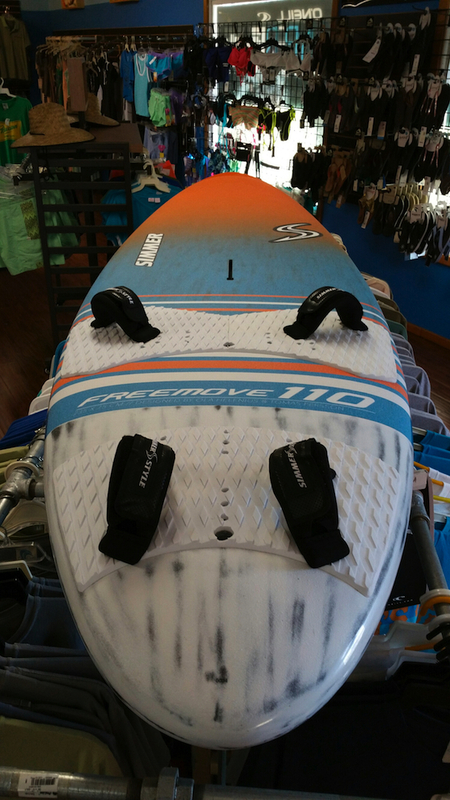 We got a 2016 Simmer FreeMove 110 in the other day to test out and we have had some pretty good conditions lately to give it a go. The first day I sailed it was with the 2016 Ezzy 6.5 Cheetah. I couldn't have picked a better combo as the sail was perfectly balanced with the board. It was a nice 18-22mph NE day. There was more wind in the morning so quit a bit of left over chop which was good to see how it would affect such a wide board. The first thing I noticed when I jumped on the board was just how wide it really was. It is probably the widest board I have ever sailed. I immediately thought it was going to bounce like hell in the chop. I was very surprised to see it cut right through the chop like a much narrower board. I believe the short length helps as it can fit better inbetween the chop and not bounce from once piece to the next. It also has a pretty good amount of Vee forward to help cut through it rather than absorbing it with the full width of the bottom. The Vee tapers out to just a slight touch running off the tail with helps to keep that smooth ride under your feet as well. The vee also allows to board to get over on a rail easily and it turns on a dime. The continuous outline curve and short length give it a very tight radius turn and there is just enough tuck in the rails to make it prtty smooth throughout the turn. The thinner rail profile also allows sucha big volume board to sink the rail in the turn so it holds in even in those over powered gusty transitions. Usually when adding all these features to a board it become dog slow but it has a very flat fast rocker line that allows it to get up and plane almost effortlessly. It is very fast off the wind but with the continuous outline curve you lose the ability to drive the board up wind with top end speed. It goes up wind well just not with that extra gear that you would find in a straighter outlined slalom or race board. That said 90% of windsurfers arent looking to race to an up wind mark so for the average sailor this is going to be a GREAT all around light to moderate wind board. For me being 225-230lbs the sail range for this board would be from 7.5 down to about a 6.0 or maybe even an under powered 5.5. Obviously a light weight sailor would use bigger sail sizes. The couple things that stood out on the board was first the grip of the textured deck. 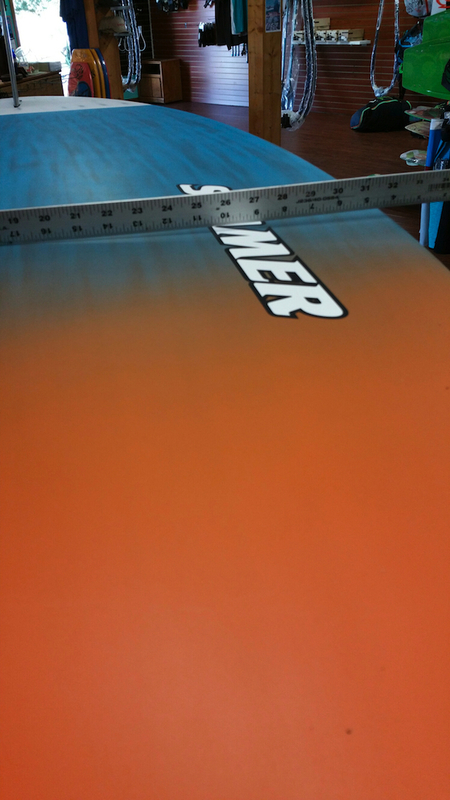 It is far and away grippier than any other production board I have ever sailed. It reminds me of our custom boards which you never ever slipped on. The other thing was that stood out was the construction. It's not the lightest board on the market but it feels very solid and substantial like it's going to last more than a couple seasons. 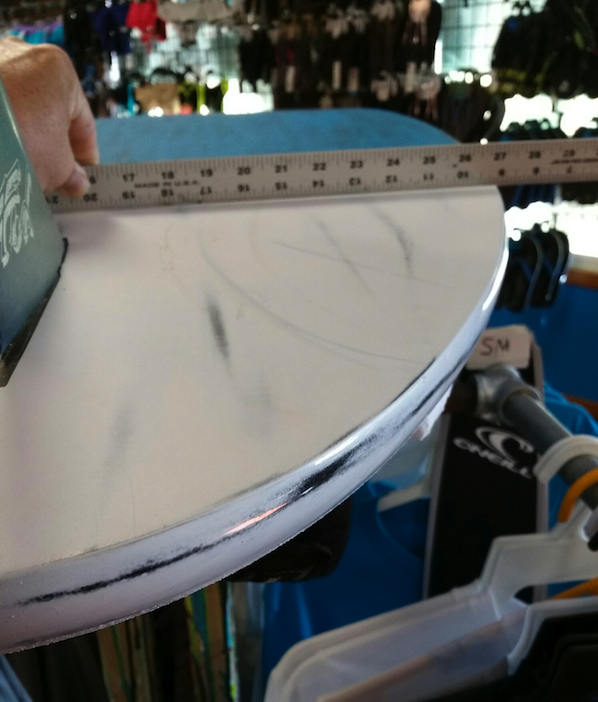 We have noticed alot of the production companies lately have been chasing the lightweight boards to the point where the boards feel almost fragile while sailing them. You feel every chatter and the boards almost start flexing under your feet as you sail. This is definitely not the case with the Simmer. It is rock solid and smooth under your feet. 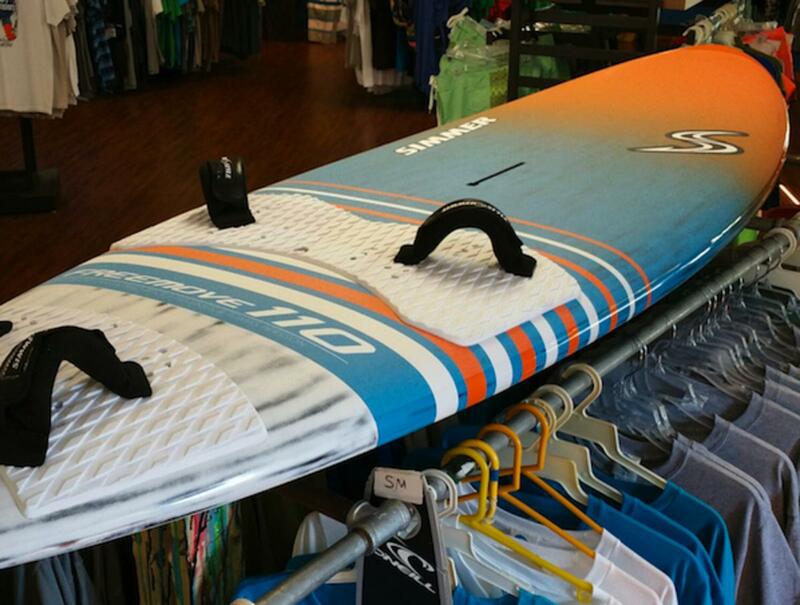 I had it set with the furthest out and back footstrap setting trying to get the most speed possible out of the board. There are a variety of hole settings thattcan move you much further forward and closer to the center line which would make the board even easier to turn. Overall for the class of board I would rate this one a 95 out of 100. A good solid A. This class of boards is meant for the intermediate to semi advanced sailor that wants an EASY board to sail that has some top end speed but more so turns and sails like their smaller volume boards. The 2016 Simmer Free Move nails this category and there isn't much I can see after the first few times sailing it that they could do better for this type of windsurfer. I would strongly reccomend trying one if you are interested in a "Free Move" board range in the 100-120 Liters.